I was looking at my bookshelf and I have no idea how this book got there or where it came from or who it came from. Actually now that I think about it I think that Elee gave it to me when she returned some books that I’d lent her and this was not one of them but it ended up with me anyway so if you’re reading this and you are missing your copy of The Mercy Journals and you want it back I might have it. But I need to finish reading it before you can have it. Oh, and wouldn’t you know it, the book is dystopian, post-apocalyptic speculative fiction. I wasn’t even trying. So far it’s okay. 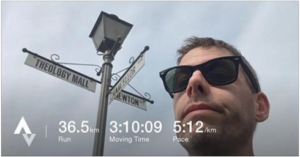 I ran 36.5 kilometres on Sunday and I didn’t die, though I also got a bit bored at the end and ended up running the last couple at a slightly sub 5 minute/kilometre, which is not exactly the goal of an LSD day. I still don’t quite understand the LSD but I’m still trying to follow it. Regardless, at the end of my Easter Sunday LSD I was pretty confident that I could easily do another 6 kilometres and being that according to this schedule I’m following it was my last long run before the marathon May 7 I’m pretty happy with my mental confidence and my physical level. I’m not sure that I’m going to meet my rather lofty goal of finishing in under 210 minutes. I’m okay with that. I think. We’ll see what happens race day.